You have a lot of choices in life and the school you choose for your children is a pretty important one! With all the options out there, we’d love to let you know why we think ACS is unique. From part-time Kindergarten and a full music program, to real-world learning and a great athletics program, we think we have something pretty special going on. To initiate the application process, please complete the Admissions Inquiry Form. Our Admissions Coordinator will contact you to answer any questions and let you know about availability, admission criteria, the admission process, and how to receive an application package. Below are samples of the application package for your reference only. Tuition is always the bottom line, isn’t it? We feel so strongly that education at ACS is an INVESTMENT into your child, into our community, and into God’s Kingdom, that we feel no need to hide or bury our tuition rates. An investment always costs something and this one is more than worth it! We also do all that we can to keep rates low especially for families with multiple children. PLEASE NOTE: Tuition fees for next school year are set in the spring and usually see an increase of 2% to 5%. WHAT WOULD YOUR TUITION BE? 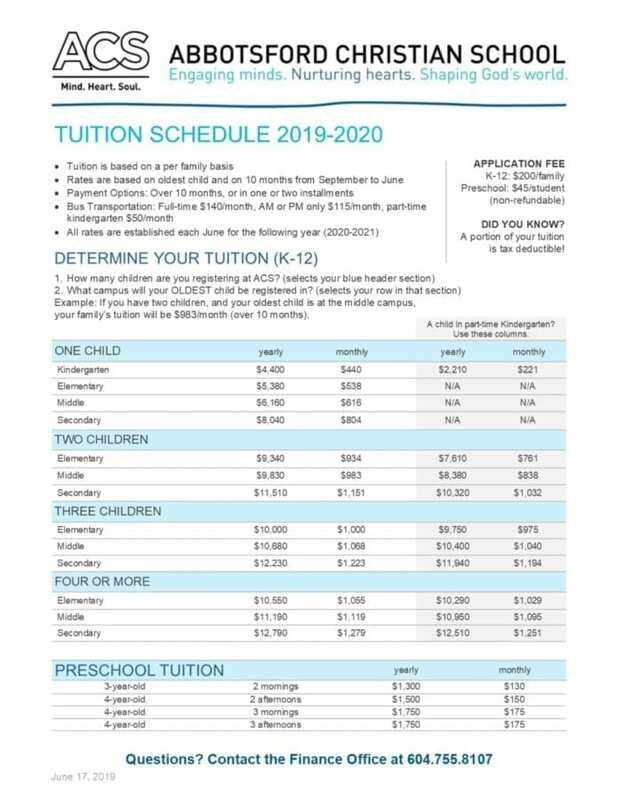 Example: If you have three children, and your oldest child is at the middle campus, your tuition for ALL three kids will be $1,017/month (over 10 months).